The Mud Season 2014 is primed to be a great time due to the tremendous amounts of snow and rain. Customize your jeep or truck and demonstrate your talents on a good muddy, swampy course. You can settle disputes while having some fun. While the “girly men” have been whining about the worst Polar Vortex ever, you have been preparing for the inevitable mud courses. It seems like some people want to outlaw fun. With the Mudding Season in 2014, you can let your inhibitions go as you find the best way to navigate wet, moist and muddy terrain. Leave the wimpy girly man behind crying about “Too Muddy!” He can eat your mud! Is Your Truck a Mudder? You want to make sure that your Monster Mudder is ready for the 2014 season. You will need a higher vehicle clearance, low gears that won’t stall, powerful tires and protection from flooding your engine with muddy water. A professional or amateur mechanic can create a Mudding Masterpiece. Demonstrate Your Mud Maneuvering Skills! If your friends think they are the best at managing tough conditions, now is the time to settle the score. Mudding is a unique challenge due to the following problems: getting stuck, flooding your engine and rolling. The novice will get bogged down in the mud by spinning his wheels too aggressively or too passively. 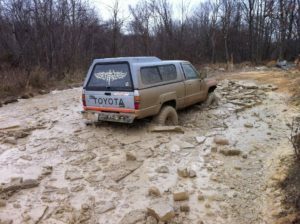 Driving through the mud demonstrates your driving skills and the power of your truck. The successful driver for the Mud Season 2014 must know how to manage different conditions and circumstances. A good Mudder drives slowly in the lower gears on a straight path with steady gas pressure for good traction. He neither rides the gas pedal nor the brakes as he manages the course. Many will depress the gas pedal even more when they start to slip, but the opposite is required to be successful. When you hit a slippery section, you may need to swing the wheel back-and-forth to regain traction. As you become more proficient, you can add more water, logs or hills. Time your progress. After enjoying the Mud Season 2014, you will have a good reason to get a good truck wash. Have fun!